Hendi Rachmat graduated 2015 March 25th, after which he left the ORL. I come from beautiful city of Bandung, West Java, Indonesia. After completing bachelor degree in Electronics from the Department of Electrical Engineering, National Institute of Technology (ITENAS) Bandung in 2000, I worked as an educational staff in the same department since April 2001. In November 2004, I graduated from the master program in Biomedical Engineering at the Department of Electrical Engineering ITB. My research interest during master program, was focused on biomedical instrumentation and telemedicine system. In December 2009, I was awarded DIKTI-Indonesia scholarship and I joined the Ph.D. program at the BioMedical Engineering Department (BME), UMC Groningen, The Netherlands. Currently I am working as a guest researcher at Orthopaedic Research Laboratory. Of all knee ligaments, the anterior cruciate ligament (ACL) is the most frequently disrupted as a result of extreme pivoting and other abrupt movements during sport activities. An untreated ACL-deficiency can provoke cartilage degeneration, leading to osteoarthritis and finally a total knee arthroplasty. ACL reconstruction is a common surgical procedure aimed to restore knee joint stability and prevent its later degeneration. 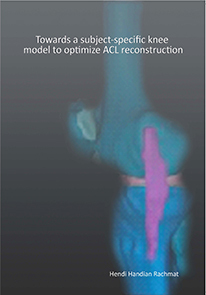 My research is focused on development of the subject-specific 3D human knee joint model in order to optimize results of the ACL reconstruction. To build a subject-specific 3D model, we use geometries of cadaveric human knees and experimentally determine material properties of main soft tissue structures. Currently I am developing the 3D knee geometry which consists of four knee bones (femura, tibia, fibula and patella) and eight soft tissue elements (3 articular cartilage, 4 main knee ligaments and a pair of menisci) and testing some mechanical properties of the human posterior knee capsule. All of these data will be used to model the ACL behavior through the 3D finite element knee simulation.